Big, rich and powerful with an oily mouth-coating texture releasing: oak, German marzipan pastries (stollen) and bittersweet black forest, stone fruit, honeycomb, cherries and sherry with dusty pure cocoa emerging into a drying oak driven finish with sherry, raisin, wood spices and grappa glazed prune with an anise seed nip. Humphrey Bogart must have reflected on his charmed life before uttering his following last words: “I never should have switched from Scotch to Martinis”. 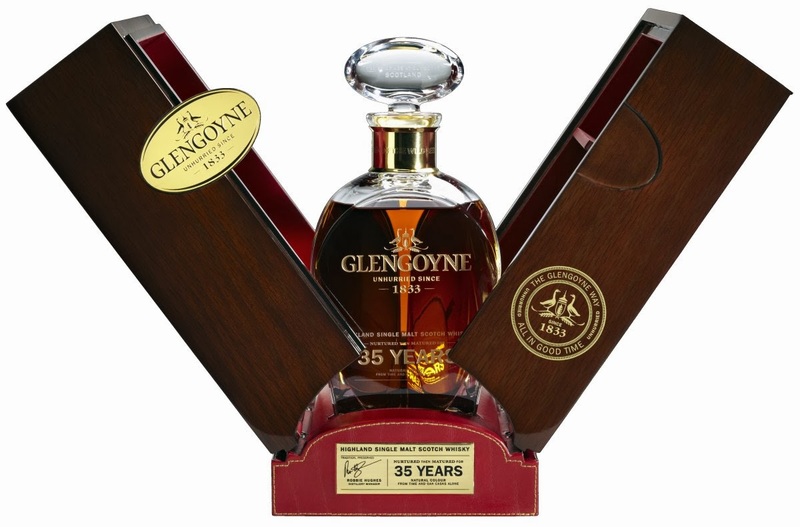 These words came flooding into my mind about the same time Glengoyne 35 Year Old set my taste buds blazing with the flavours of three and a half decades of maturation. I get the feeling that Mr Bogart was simply saying that we should, when opportunity knocks, try something new (a Scotch, which changes from batch to batch) rather than something familiar (a boringly consistent Martini). Glengoyne 35 Year Old is one of those whiskies that I can fondly look back on and say, frankly my dear, I gave a damn. It makes me think that Mr Bogart was onto something – variety and memorable moments are the spice of life. 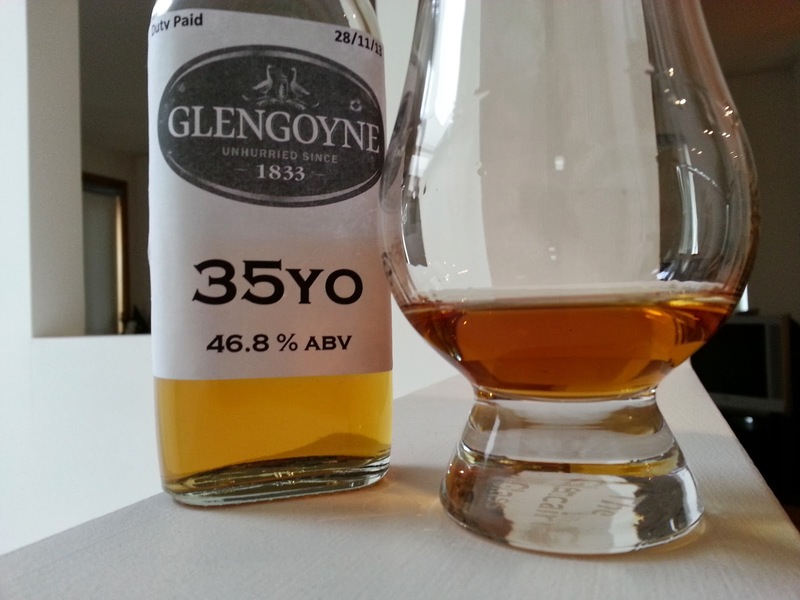 The Glengoyne 35 year old struck me as a whisky that has aged gracefully, retaining some freshness and spark while developing a lovely oily texture that carries musty oak driven age. This is a grand old whisky that is hard to fault no matter how carefully I smell it or swirl it around in my mouth – it has everything you want in an old whisky, but with some energy and bravado which signifies that this whisky has been drawn out of the casks at an ideal time. It does offer a burst of oak on the palate that progressively dries into the finish, so this whisky is highly recommended for those who enjoy picking apart older whiskies with a heavy (but balanced) oak influence. A bottle of this whisky will set you back £2,850 (approximately $5,175). Not only is it sublime for drinking, but it is incredibly rare – only 500 bottles are available worldwide. Knowing its rarity makes savouring this whisky a very special experience, where sniffing and sipping a small dram can last an hour. This is one of those whiskies that you can appreciate, with a sense of feeling lucky and a big smile on your face. Unpacking the sample, I felt like a little boy on Christmas day! That has to be a big part of the whisky experience. For more information about the Glengoyne 35 year old you can read Glengoyne’s responses to a few of our questions by clicking here. If you would prefer to watch a video review, please click play below (note: the colour of this whisky is better captured in the below photo). Nose: Faultless! All the different notes whizz around in the glass to create a bouquet that is soft, fresh, musty, sweet and oaky. That sweetness (glazed cherries, sherry) wafts up with dark chocolate, vanilla fudge cake, crushed walnuts, German marzipan pastry (stollen) and whipped cream. This almost smells like a fresh bag of stollen, with the sugars, marzipan and pastry all intermingling. Soft calf leather and polished mahogany develops, and as the whisky rests marzipan pastries dusted with icing sugar emerge with boiled sweets and a subtle shade of mint and nutmeg. This is one of those bouquets that cannot be faulted, no matter how much one tries – it has ideal intensity, alcohol volume, balance, complexity. Taste: With a delightful mouth-feel and rich oily texture this whisky glides down the palate as though it is liquid velvet. The dense and slightly viscous texture coats the palate with layers of flavour – big rich bursts of oak intermingle with waxy honeycomb, red cherries, sherry and bittersweet black forest as a dusting of cocoa, nutmeg and the spritz of soft citrus (tangelo and lemon biscuit) begin to add a drying bitterness that proceeds to the finish. Finish: Long. The pure cocoa intensifies into a warming glow of dry wood, and then sherry, raisin and grappa glazed prune begins to pierce through that layer of oak with nutmeg and wood spices accompanying the nip of anise seed. This entry was posted in 5stars, Highlands. Bookmark the permalink.